My love for In-N-Out Burger can often be misunderstood. You see, to some, it seems like that I love In-N-Out over any other burger I've had. That cannot be further from the truth. I've had much better burgers, but they usually cost more money. For me, you really compare things that were never meant to be compared in the first place. 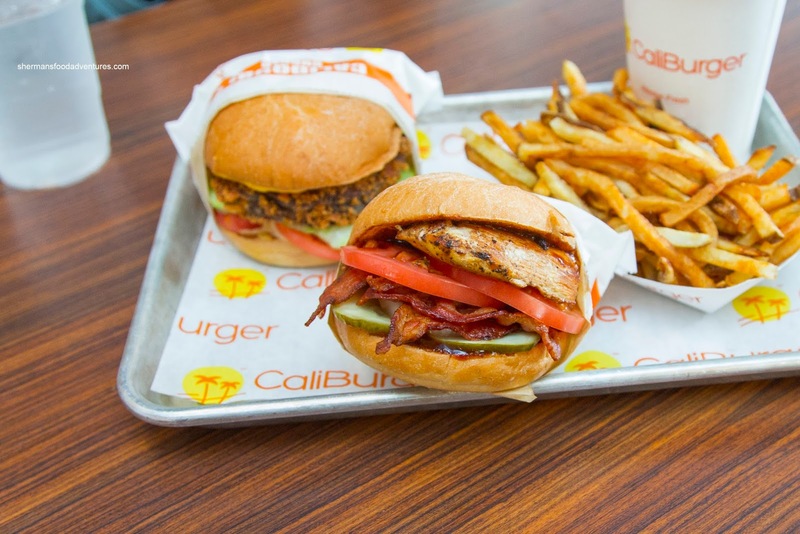 Now, that brings us to Caliburger. Okay, I know what you're going to say, "but they are a copycat chain!". Yes, they technically is true, my visit to the Seattle Caliburger taught me to think otherwise. I believe both are good in their own ways and are really not alike at all (despite all the references and similarities on the surface). 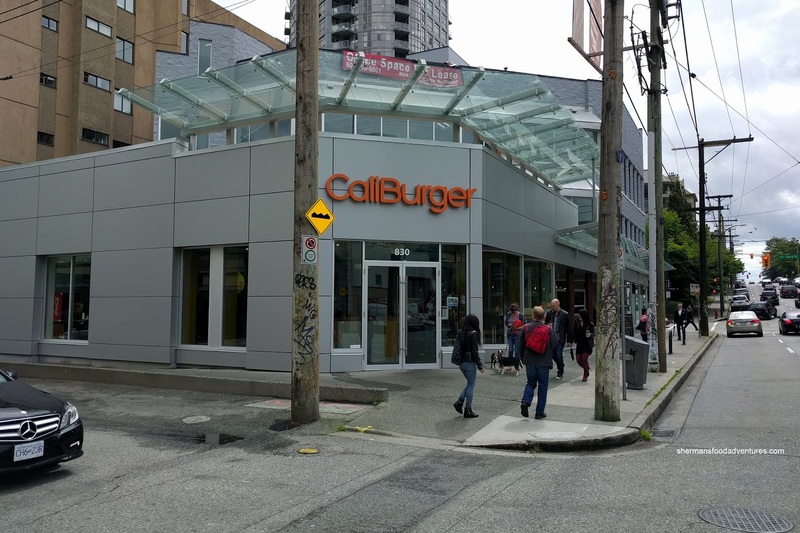 I was recently invited along with Sean, Sharon and Grace to sample the menu at their new location on Thurlow at Robson. As mentioned in my previous visit to the Seattle location, I found the burgers to be good with fresh meat and produce, but the whole thing was a little lacking in salt. But if one added bacon, it solved everything. 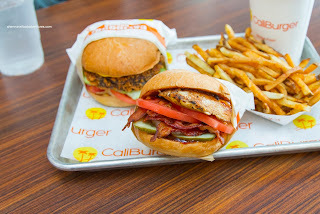 So hence the Bacon Cheeseburger (not Calistyle). Well, even without the bacon, they seemed to have gotten the seasoning right here as there was enough saltiness to go around. My only wish is that the bun was a bit softer. As for the CaliDouble, we did get it Calistyle which adds cheese, grilled onions and Cali sauce (think spiced up Thousand Islands). 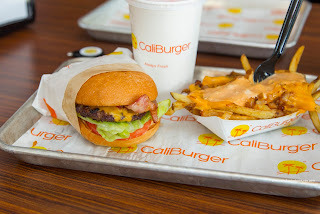 To me, Calistyle is the way to go as there is more varied flavours from the sauce and grilled onions. Furthermore, the added moisture softens up the bun too. 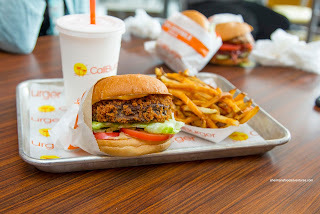 We also tried their Cali Chicken Sandwich with both the chipotle BBQ sauce and the avocado mayo versions. For me I found the chicken to not be necessarily dry, but not succulent either. There was enough sauce and ingredients to make up for it though. My preference was the avocado mayo as it was milder. The BBQ sauce was sweet and spicy. The most shocking thing to come out of this tasting was the CaliBello Mushroom Burger - I loved this more than anything else I had! Being a meatatarian, this was totally blasphemous! The panko-coated portobello mushroom was a beautifful thing. Crunchy outside and tender on the inside, I didn't miss the meat with every bite I took. It was dressed in a Calinaise that had a hint of mustard. I would gladly order this again. 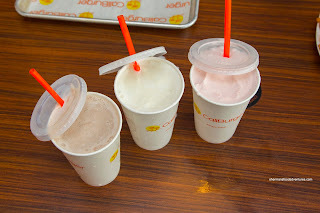 Of course we had beverages with their Milkshakes (flavours left-to-right: chocolate, vanilla and strawberry). These were definitely thick and not lacking in flavour albeit rather sweet and artificial tasting. They were fairly creamy with no ice crystals. Oh and I forgot to mention the Fries! For me, I like them crispy and these were close, however, personally I would ask for them to prepare it extra-crispy when ordering. Call me boring, but I like my fries plain instead of Calistyle. So from this tasting of the entire menu, my favourite was shockingly the CaliBello Mushroom Burger. On the other hand, the CaliDouble was not too far behind (Calistyle). Remember what I said about not comparing despite the similarities to IN-N-Out? 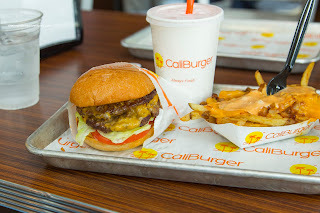 You really can't because Caliburger is not In-N-Out, just look at the menu, it's different (and pricier too, mind you it's in Canadian dollars). Priced themselves out of the market. It's "just" burgers and if they price the same as Five Guys, Five Guys wins every time. I only tried their fries with their special sauce because I never got to try In and Out version. I was really disappointed. It tasted like McD fries covered in thousand island dressing. Couldn't finish it. I guess I'm spoiled by our awesome canadian poutines. Won't be trying their burgers, but I may venture to try their milkshake with cold brew coffee next time.